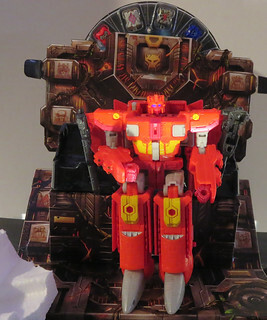 From the past, his name is Sentinel Prime. He knows he isn't in his right time, because he recognizes where he is. He is sitting in his command throne in the Great Spire. The Great Spire was the symbol of his Cybertronian government. Strong, opulent, and powerful. Now he sits in the spire's ruins. He doesn't know that the Decepticons viewed the Great Spire as the symbol of the corruption and oppressive nature of the world under Sentinel's iron fist. The Autobot who would become Optimus Prime even cheered when the Great Spire fell, but that was before Megatron's true asperations became apparent.